Jagmeet Singh is failing a key test in his first few weeks of being the leader of the New Democratic Party. After refusing to condemn the mastermind of the Air India bombing during an interview with CBC, Singh has declared that the very fact that he was asked has to do so was because of racism. That’s right, don’t ask the NDP leader tough questions or you are a racist. Here’s how The Huffington Post opened their story on this and framed it up. 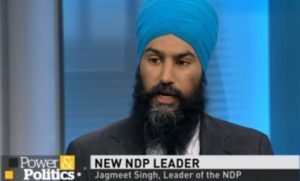 NDP Leader Jagmeet Singh thinks a controversial CBC interview in which he was asked repeatedly to denounce the veneration of alleged Air India mastermind Talwinder Singh Parmar was racist. “Should I just say ‘yes’ directly? I think there was definitely some sort of clear problematic line of thought behind that question, so I’m definitely concerned with it,” he told reporters Sunday when asked if he felt the questions were racist. They open by calling the interview, that I don’t think they ever wrote about, “controversial.” And then Singh is asked if the questions by CBC reporter Terry Milewski were racist. I’d say that is utter BS. You can watch the segment of the interview right here where Milewski asks Singh to say whether calling Talwinder Singh Parmar a martyr is wrong. Singh was asked several times to say calling Parmar a martyr was wrong and he refused to do it. Now Singh’s backers keep pointing out that he was being asked about something from long ago, 1985 and that was before his time so it is unfair. Singh attempted to answer Milewski’s questions by pointing to an event that happened in 1984 in India, not 1985 in Canada. This is also not a dated question. Politicians have been caught up or embarrassed by going to events where Sikh nationals hold up posters of Parmar and claim he is a martyr of the Sikh nation. This has happened in the GTA as well as in Vancouver. In refusing to answer the questions in a straightforward manner and then claiming that to question him about condemning the mastermind of Canada’s biggest terrorist attack is a racist act raises more questions about Singh. Why wouldn’t he condemn Parmar? Is he worried about losing support from people in this country that vote and don’t consider the now dead terrorist to be a terrorist? If that is the case voters need to know. If it’s not the case, Singh has an easy way to stop that idea from spreading. So true Brian,jeep up the great job of letting Canadians know the real truth,and not what the MSM tells us. But But But, he is running for Prime Minister of Canada not India? See! Nothing to do with India or its problems? Who cares that it happened “before his time?” I can tell you right now that I personally condemn the Holocaust, evendors though it happened well before “my time.” Such avoidance is asinine. Hah, he doesn’t answer questions just like Trudeau. Maybe he should be a Liberal. I think it was another mistake they made voting him in as NDP time will tell he seems like a slippery one like Trudeau I don’t trust him at all !! In their use of the racist-exit sign, NDPer Singh sounds like Calgary’s Nenshi.